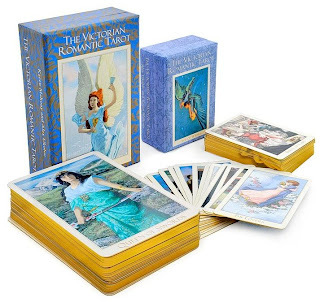 Rejoice tarot lovers after some time the well-know even well-loved Victorian Romantic Tarot who was for some time OOP (with prices exploding on eBay and similar sites) comes back into print scheduled for November 2012. As with all Baba Studio's before a deck comes out of the OOP status and back into circulation it underwent a thorough renewal, reworking to fit the artist high standards, elegant taste and inspiration. You can now pre-order it in a bundle together with a mini version of it. (and you even have the possibility to ad some special extras. The pre-orders will be taken in batches, you can subscribe to a list to be notified when the next one starts. The link to the pre-order page is here. This interpretation of these works looks very colourful, and outspoken, it could have been made by some characters, I'm thinking of the Mad Hatter, Cheshire Cat or the Caterpillar here strong,colourful, perhaps a bid insane even....a look that fits the more psychedelic aspects of the books. Artist Rodney Howington didn't hold back and went all the way in the chosen look making this a bold statement and powerful visual item popping right at you, in your face and proud of it a deck fit for 21st century lovers of Alice in Wonderland and Through the Looking-Glass. You can buy it at the artist Etsy shop here. The Symbolist Tarot sadly didn't make it's needed financial go last time, but rejoice, the artist is back on Kickstarter to make an other go at it! So i really really hope this time the funds are raised and the deck gets printed (and yes into my collection it will go) I'm once again a backer, are you too? Update: as of 16 august 2012, the tarot met its funding goals, and Richard expects receiving the final decks in October, shipping them out to the backers will follow quickly, so I expect getting mine mid-November. I recently obtained a new Russian deck by prolific deck creator Vera Sklyarova, this time in collaboration with the artist A.Razboinikov.Published end of 2011 this is a fairly recent addition to the Russian subdivision of my collection, and as with miss Sklyarova's previous creations published in a very good quality set, with book in Russian (sadly, because I'd love to know moere about how she made her connections between the deck and Dante's work..) . As with all her decks this one is themed and this time she used the Divina Comedia (an epic Dante Alighieri between 1308 and his death in 1321, the work written in the first person, tells of Dante's journey through the three of realms of the afterlife namely Hell, Purgatory (guided by the Roman poet Virgil), and finally Heaven (guided by Dante's personification of the perfect woman Beatrice). The structure and imagery follows closely the book, so you need to know it or at least have the book close to you to grasp the deck and what the artist is saying in these 78 cards, the major arcana follows closely the WCS structure, the minors, as with all of miss Sklyarova, follow a more liberal, personal interpretation, guided by her own experience and the used theme.